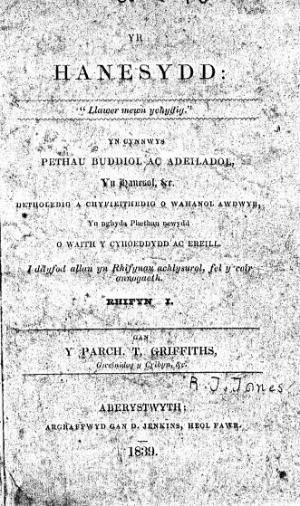 An irregular Welsh language general periodical circulating amongst the Unitarians of south west Wales. The periodical's main contents were articles on religion and current affairs alongside poetry. The periodical was edited by the minister and schoolmaster, Thomas Jeremy Griffiths (Tau Gimel, c.1797-1871).